Nadine Dorries MP got her day in the headlines, her debate in the House of Commons, her face on TV, but surely she’s wasting her time. Abortion is a settled issue in the UK. We don’t like it, there are too many, and women often regret them, but what can we do? We like banning it even less. Mrs Dorries can bang on all she likes, but the law isn’t going to change. Or is it? This pro-choice doctor, who like everyone else also dislikes abortion, isn’t so sure. Mrs. Dorries found a chink in our pro-choice armour, the counselling, and chipped away to good effect. The people who profit from abortion, the doctors who do it and the organisations they work for, also provide most pre-abortion counselling. They may do all they can to avoid being influenced, but they have an interest in the abortion going ahead. They cannot present the case for continuing the pregnancy, or having the baby adopted, with the vigour a pro-life counsellor would. Nor should they. It’s not their business to persuade people against abortion. They are supposed to be “non directive”, and they are. The undecided woman who walks into an abortion clinic because she knows nowhere else to go, meets wonderful well-meaning doctors and nurses who’ve been trained not to persuade her. I know because I’m one of them! She tells them she wants an abortion, not because it’s necessarily her settled view, but because she’s in an abortion clinic, and she thinks that’s what she should say. Soon another frightened girl is gently, non-directively, propelled down the abortion route. You’re right Mrs. Dorries. Insist the counselling is done by an independent person. You’ll cause trouble. Some women will have their abortions delayed. Some people will demonise you, David Cameron will patronise you, but the women who pause at the brink and pull back, and their babies, will thank you. And when this battle has been won, get up a stink in parliament to ask why the government is subsidising abortion. The NHS pays the private sector about £34M per year to do about 80,000 abortions. The other 90,000 or so, done in the NHS itself, presumably cost about the same. About £70m a year for something everyone thinks there is too much of. There’s no need to recriminalise abortion. We should just stop the government paying for it. The vast majority of people who really want one could easily afford it, and there are plenty of charities for the really poor. 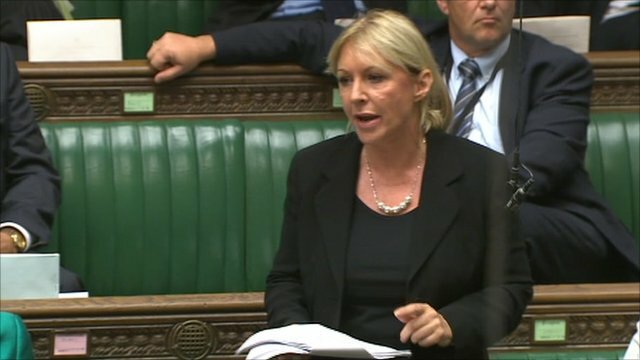 On 7 Sept an amendment to the Health Care Bill tabled by Conservative MP Nadine Dorries, which would have stripped non-statutory abortion providers Marie Stopes and BPAS of the ability to provide abortion counselling, was defeated by 368 votes to 118. However, the health minister Ann Milton has promised a consultation on the issue, and MPs will have another chance to vote when the results are presented to parliament.